Towers and Turrets and Kiosks - Oh My! 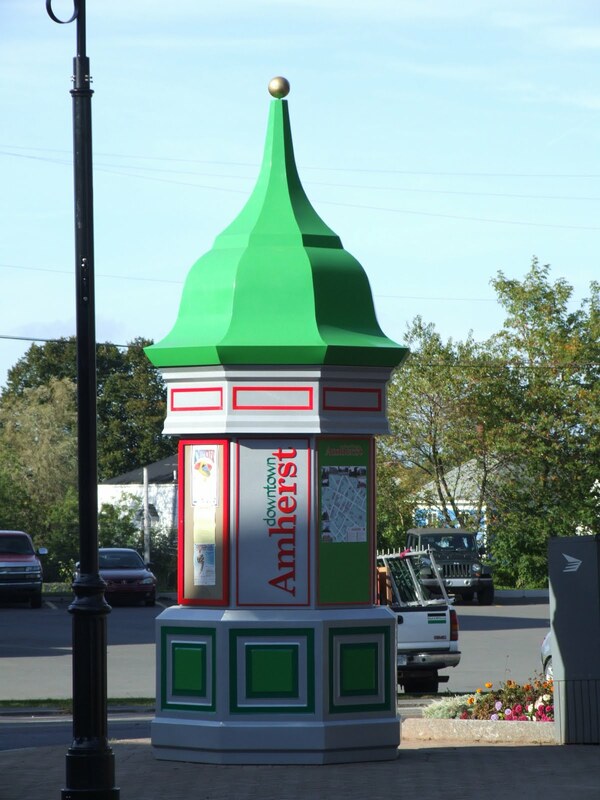 The town of Amherst works diligently to improve its functionality while maintaining a pleasing aesthetic. Last week, these little kiosks began popping up, almost as quickly as mushrooms. They are information centres so that visitors and locals alike can see what's going on around town. They are cute little structures, eye catching with their unique shape and bright colours. Approaching from West Victoria Street the other day, I saw something else that I had previously not noticed. The roof of the kiosk is a replica of the top of The Old Clock Tower, one of Amherst's most recognizable historic buildings. I think this attention to detail is impressive. 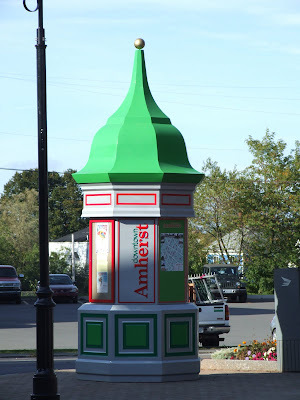 Amherst is, after all, known as the "Town of Towers and Turrets" so it's fitting to honour that. 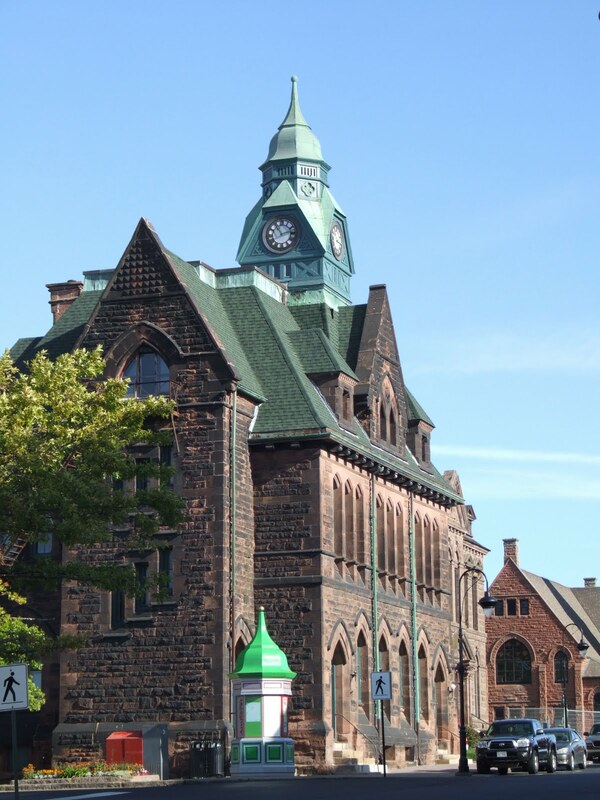 In total, there are four kiosks located around the downtown: The Old Clock Tower, Victoria Square, The YMCA and The Four Fathers Library. 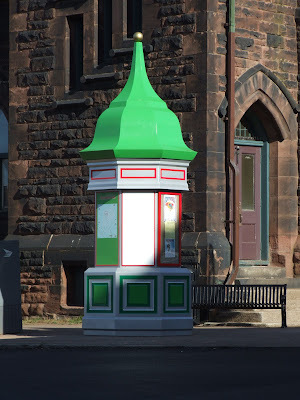 This shot is taken along Victoria Street and you can see a second kiosk right below the turret of First Baptist Church, in Victoria Square. It's terrific to have these in place for the influx of visitors to our quickly-approaching Fibre Arts Festival. It's All About The Festival! We're moving into the final stretch before the Nova Scotia Fibre Arts Festival. The elves have been busy helping me package up goodies. There is lots to be done. My purchase of a wide format printer earlier this year has come in very handy for doing posters. Polly loves the printer; she runs to catch the paper as it comes out. 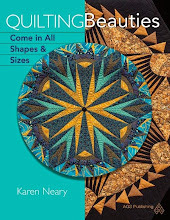 In between packing and paperwork, I am sorting quilts to take to the Thursday show. This one was quilted but never bound, so I will stitch that on this evening. Amazingly, I had made the binding when I pieced the top and placed it in a baggie pinned to the quilt. I wish I were always so organized! It's such a good feeling to finish a project that's been lying around. The Grapevine Stole has been gifted and worn for the first time yesterday. The background and lining of the stole was an ivory bridal satin, interfaced and with an additional interlining of cotton for stability. There was no batting used. It is based on the scripture, “I am the vine, you are the branches. If a man remains in me and I in him he will bear much fruit. Apart from me you can do nothing.” John 15:5 The cotton grapes and vine are machine appliquéd, with hand-stitched dimensional grapes. 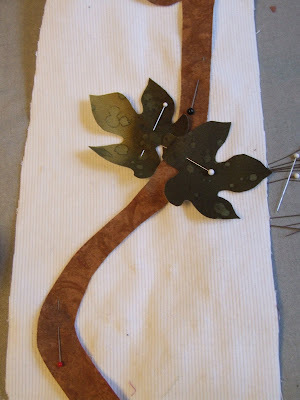 Sulky rayon machine embroidery thread was used to add some stitching details on the leaves and vines. It appears to have been very well recieved. I've been contacted by the church already to do more pieces for them...but not until after Fibre Arts Festival! Cumberland County is a great place to visit-just ask that group of quilters from Shelburne County who passed through again yesterday, making a bee line for the fabric department at Dayle's ! They will be returning to our area for the N.S. Fibre Arts Festival in October. 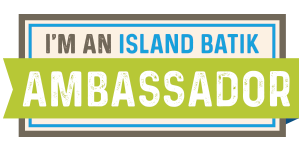 Not everyone gets to travel with like-minded fibre enthusiasts however, and if you find yourself in this situation, The Cumberland County Heritage Network Society may have the solution. 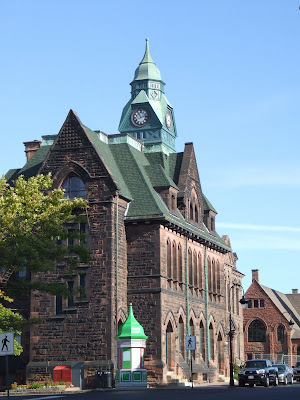 On Saturday, October 15 they are conducting a Mystery Bus Tour of Cumberland County. It runs from 9 am to 6:15 pm...freeing you up to enjoy the day's events at the Fibre Arts Festival. For more information on the bus tour, visit C.C.H.N.S. or email Rosemary. and soon to be delivered. Whew...just under the wire. I will post pictures of the completed stole after it has reached the intended recipient. Joan at Ouvrages d'une Acadienne is having a give away...but she's making you work for it. Check it out! The new stole is coming along very slowly. 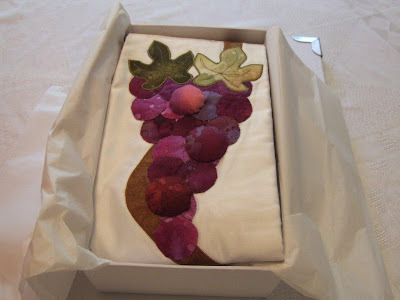 The background grapes are pretty much stitched down, now it's a matter of hand appliqueing some stuffed grapes on top. It's been labour intensive and I needed a break. Across the Tantramar Marsh, Sackville, N.B. had all kinds of interesting things going on this weekend. In addition to it being Homecoming weekend at my alma mater (Mt A. ), the town was hosting a fall festival. Hubby and I chose to attend the opening of the Campbell Carriage House Museum. It was an absolutely delightful presentation, including an original 3 act play outlining the history of the carriage house. It also included a recitation of The Village Blacksmith, written by Henry Wadsworth Longfellow. The museum is beautiful. There was an amazing collection of silver and pewter hardware. This clever display has the traces hitched to a virtual horse. For me, the most interesting part was watching the blacksmith work, as this was my grandfather's trade. This fellow was very skilled. Now it's back to stuffing grapes. 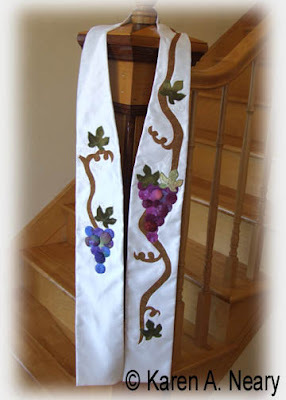 There's really no time to waste, as this stole is supposed to be worn this coming Sunday! ...and these circles will be appliquéd to form a cluster of grapes. We are auditioning which combination of colours and prints will work best. Fossil Fern is lovely for the grapes and leaves. We expect to toss the others out. Polly likes the little fabric circles. They will be placed on the vine just below these leaves. Polly found the work exhausting...or boring...or perhaps a little of both. She conked out on the warm ironing board part way through the first cluster of grapes. She is laying on the fabric I wanted to use, but she's just too darned cute to disturb. A quick note to let everyone know that I will be placing an order to Wonderfil Thread very soon. This is only for folks in the local area, or those who will be attending our N.S. Fibre Arts Festival and can pick up their thread in person. No mail orders will be accepted. There are lots of wonderful threads on their website, but two I especially like and recommend are Konfetti and Invisifil. For info on prices, or to place an order, send me an email by today's end. 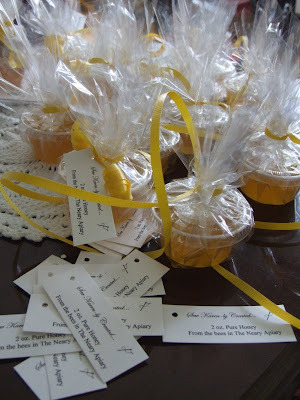 This post is for Monika Kinner-Whalen of My Sweet Prairie. 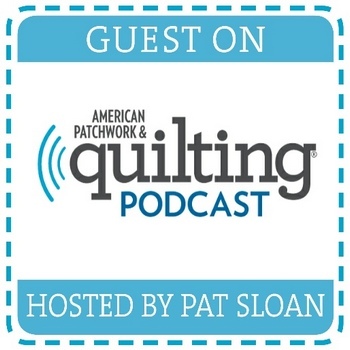 Monika is a quilter, artist and photographer whose blog I read on a regular basis. One of the things I enjoy most is how Monika sees beauty in everyday, ordinary things which most of us miss. Monika often photographs grasses, wildflowers, and fields of flax on her beloved prairies and then translates those photographs into exquisite thread painted works of art. Earlier today, hubby and I visited the beeyard and the gate at the end of the lane made me think of Monika. Goldenrod, white asters, mountain ash berries, spikes of Timothy and a myriad of things I can't name spilled over an old section of fence. Unfortunately, I didn't have my big camera with me but I plan to revisit and take some more shots. My favourite was this part with dead, almost silver branches reaching over the red berries. During this year's Fibre Arts Festival, I am enroled in Kathy Tidswell's "Painting With The Sewing Machine" and I hope to stitch this out a la Monika.